Last week, we learned that the Pentagon is sending 800 to 1,000 troops to America’s southern border, to deal with the thousands of so-called “migrants” in the so-called “caravans” that are traveling through Guatemala and Mexico, with the intent to crossing the border into the United States. Earlier this year, the military had already deployed about 2,000 National Guard troops to the border. Yesterday, in a tweet, President Trump called the “caravans” an “invasion of our Country” and warned the “migrants” that “our Military is waiting for you”. By “our Military,” Trump means not 800 or 1,000, but 5,000 troops who are being deployed to secure our southern border. As reported by the Wall Street Journal, the mission of the 5,000 troops is “Operation Faithful Patriot” — a military force equal to about one-third the number of U.S. Customs and Border Patrol (CBP) agents currently working at the border, and a larger deployment than we have in Syria and Iraq, and about half of what we have in the field in Afghanistan. Of the 5,000 troops, about 1,800 will go to Texas, 1,700 to Arizona, and 1,500 to California. The troops will be drawn from about 10 U.S. Army installations and consist largely of military police and engineers. U.S. Marines also will be deployed. Yesterday, October 29, in a sparsely-reported DHS-DOD joint press conference at the Ronald Reagan Building in Washington, DC, three Trump administration officials spelled out more clearly and in more details how the U.S. government will secure our southern border from the incoming caravans hordes of invaders. The purpose of the press conference is to provide an update on the CBP’s Operation Secure Line and the DOD’s Operation Faithful Patriot. 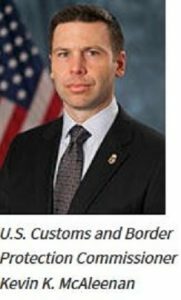 Kevin McAleenan, U.S. Customs and Border Protection (CBP) commissioner. CBP is an agency within the Department of Homeland Security (DHS). Air Force Gen. Terrence J. O’Shaughnessy, commander of North American Aerospace Defense Command and U.S. Northern Command. Kenneth P. Rapuano, assistant secretary of defense for homeland defense and global security. Canadian Free Press posted a nearly 23-minute video of the press conference, with neither a transcript nor summary. To view it, go here. Below is my transcripton of the press conference. “An update on enhanced security operations in order to address potential for large groups of migrants who arrive at the US border as part of the so-called caravan. As of this afternoon, we continue to track a large group of some 3,500 traveling through southern Mexico with the stated intent of reaching the US border…. We’re also aware of a second large group of around 3,000 migrants at [a] border crossing between Guatemala and Mexico. This means that at any given moment, there are tens of thousands of migrants between the Guatemalan border and the US border that are moving towards us. Within that flow are included about 17,000 criminals last year, along with hardened smugglers and people from over a hundred countries from around the world. Our immigration system is unable to effectively process and repatriate those without a right to remain in the United States due to an extensive backlog in our courts. 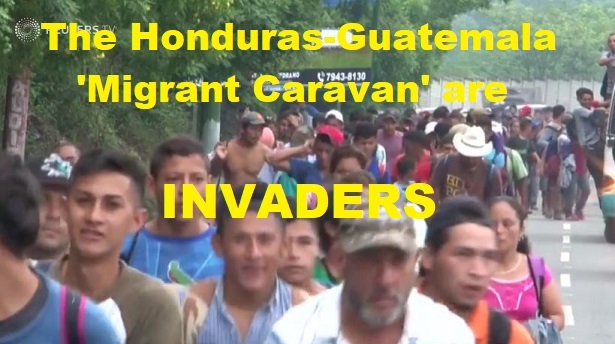 What is new and challenging about this caravan phenomenon is the formation of multiple large groups that present unique security and safety threats…especially the second large group still in Guatemala has deployed violent and dangerous tactics against both Guatemalan and Mexican goverment security teams. Accordingly, we are preparing for the contingency of a large group of arriving persons intending to enter the United States in the next several weeks. Our message to the organizers and participants of this caravan is simple — the President and DHS Secretary [Kirstjen] Nielsen have made clear we will not allow a large group to enter the United States in an unsafe and unwelcome manner…. There is no benefit in being part of a large group. The caravan has already been offered protection in Mexico and will not be allowed to enter the U.S. the same way. “Our mission of homeland defense is inextricably linked to Homeland Security’s mission of homeland security.Operation Faithful Patriot, as we have named the military operation supporting CBP in hardening the southwest border, is the latest example of this critical partnership. In a macro sense, our concept of operations is to pool our military assets with a priority to build up southern Texas and then Arizona and then California, reinforce along priority points of entry so as to enhance CBP’s ability to harden and secure the border. The specific request for assistance is for the active duty military to enhance the capacity and capabilities of CBP by providing robust military capabilities. First, the U.S. Army Corps of Engineers. They bring amazing expertise earned through years of experience under challenging conditions, including the current work of building the border wall. We’re also bringing three highly experienced and capable combat engineering battalions with expertise in building temporary vehicle barriers, fencing, and are bringing them with heavy equipment which, as we speak now, is line hauling toward Texas. We are bringing military planning teams that are already actively engaged with their CBP counterparts. This integrated command and control capabilities we are working with our aviation, engineering, medical and logistic resources to bring them to bear. We are bringing three medium web helicopter companies in. These are aircraft equipped with the latest technology. They are enhanced with optics; they have MVGs; they have sensors that allow them to operate at night, and be able to provide assistance to bring our CBP personnel exactly where they need to be regardless of the conditions. We will be able to spot and identify groups and rapidly deploy CBP personnel where they are needed. The helicopters will ensure that CBP agents can arrive in the more austere locations. They can fast-rope down if they need to; they can conduct and work their law enforcement activities. These aircraft will also ensure those agents needing medical assistance will be able to get that assistance when required. In addition, we are bringing in military police units,we are bringing strategic airlift to bear. As we sit right now, we have three C-130s and a C-17 ready to deploy CBP personnel wherever they need to be at any time. We have deployable medical units, we have the logistical support, we have command posts so we can combine with CBP command posts for our operational commanders who will work side by side to integrate our efforts and make no mistakes. As we sit right here today, we have about 800 soldiers that are on the way to Texas right now. They are coming from Fort Campbell, they are coming from Fort Knox. They’re moving closer to the border, and they’re going to continue their training, and they’re ready to deploy, to be actually deployed on the border…. We’ve already brought critical material that’s already in place. 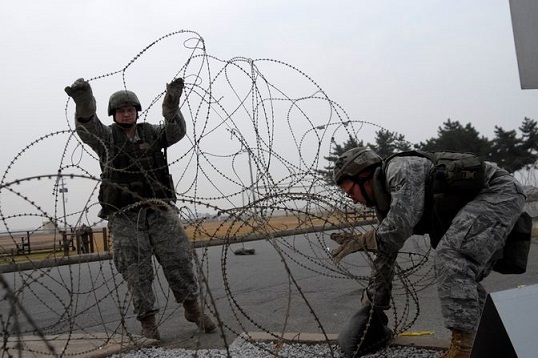 We have enough concertina wire to cover up to 22 miles already deployed to the border. We have additional concertina wire that we can string, with over 150 miles available. Additionally, we are working wherever reinforces are needed so that we can be exactly where CBP wants us to put it. By the end of this week, we will deploy over 5,200 soldiers to the southwest border. That is just the start of this operation. We’ll continue to adjust the numbers. Note that is in addition to the 2,092 that are already employed from the National Guard’s Operation Guardian Support that’s been so effective. The press conference concluded with Questions-and-Answers, beginning with a first question from a female reporter asking whether the troops deployed to the border will be armed (13:43 mark in video). Gen. O’Shaughnessy answered that the 2,092 National Guards will remain, that the military’s Operation Faithful Patriot is to support and assist the CBP, and that “everything we’re doing is in line with and in adherence to Posse Comitatus” — the Posse Comitatus Act of 1878. CBP Commissioner Kevin McAleenan emphasized that the the “caravans” are different from previous groups seeking to enter the U.S. illegally because of their violent tactics, as seen in their crashing of the Mexico-Guatemala border. That is the reason for the deployment of troops because “we want to be ready for that” “for the potential of the arrival of a large group like this”. Commissioner McAleenan said that the U.S. is working with the Mexican government, and that those “migrants” seeking political asylum have alrady been offered benefits and safe shelter by Mexico, which implies that the U.S. government will not be disposed to entertain their political asylum demands, especially if those demanding political asylum cross the border illegally. He said that the U.S. is providing access to asylum to asylum seekers “at our borders lawfully”. In the last fiscal year, Border Patrol has processed 38,000 (political asylum) cases of fear of return to a home country — “a new record”. 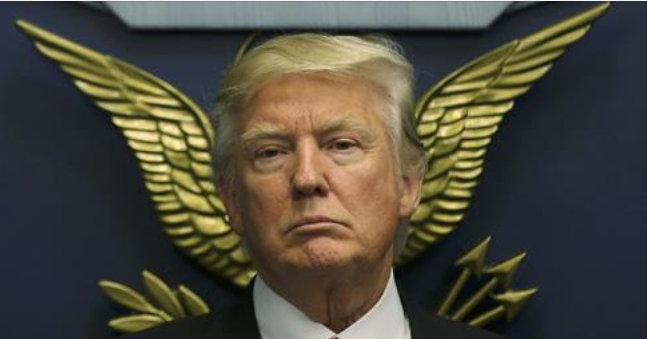 God bless and protect President Donald John Trump. Pray for him. Pray for America. 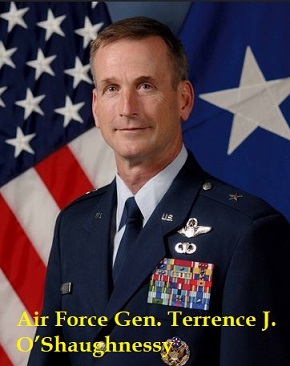 This entry was posted in conspiracy, Dept of Defense, DHS, Donald Trump, Honduras-Guatemala 'caravan' invasion, illegal immigration, Military, United States, US Presidents and tagged Air Force Gen. Terrence J. O’Shaughnessy, Defense Secretary James Mattis, DHS-DOD press conference on deployment to secure southern border, Kenneth P. Rapuano, Kevin McAleenan, Operation Faithful Patriot, Operation Secure Line, Posse Comitatus, U.S. Customs and Border Protection. Bookmark the permalink. Think of it this way, Cultural Marxist California, passes water restriction laws, to conserve water, while allowing in thousands to millions of water using invaders! Liberalism is a mental illness that endangers our environment, economy,culture,society, nation, and civilization itself. US Army Corps of Engineers get started BUILDING OUR GLORIOUS WALL ! Given the past history of our government dealing with border crossers and illegals already inside the country I have reservations. A hard stance must be taken, nothing else will work, but in our fractured society hard does not exist. Too much infighting from people sworn to uphold the standing laws. Each interpets it their own way by party platform and not by the interests of we the people. This is a train wreak about to happen and will decay into confusion and be the litmus test of which party actually rules. Trust no one in Washington DC to do what’s going to have to be done. DJT hasn’t let us down yet. You can bet he’s got an ace up the sleeve. This is not the time to get “shaky.” Trump is surrounded by swamp rats. He is opposed at every turn. He has to deal with rotten judges, a hideous media, Obozo holdovers, still dirty FBI, Muleface Mueller, China, tariffs, international and domestic crises, and the Fed is trying really hard to destroy the economy and everyone’s 401k’s along with it. Now, we’re under attack at our southern border, apparently by the entire third world. Let’s send him the help he needs in Congress and assess the situation later. “Operation Faithful Patriot” – “Faithful” can be a newspeak word for a broken promise. “Patriot” can be a newspeak word used by those who define what it means. “Operation” is used by the CIA as the first word for a stealth program we wouldn’t approve of if we knew what it really was in advance.